Link is dead, but let me know if you want it. I saw the comb&razor post, but as you say, the link has gone dead. So if you have it, please. 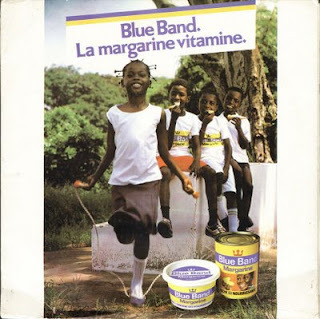 Blue Band Margarine used to be so tasty before 1987 but when I went for further studies in the UK, I came back to East Africa only to find that the taste had been changed. East African Industries used to manufacture the product but now UNILEVER are firmly in control today. I reckon product placement was all the rage in Congolese music. Tabu Ley Rochereau did his bit with "Savon Omo" inter alia and of course the Grand Maître led the show with "Arzoni", "Fabrice", "5 Ans Ya Fabrice", "Agent Travel" etc. All laundry soaps were referred to as OMO, All butter/margarine were Blue Band, even when I came to the states, I would be referring to them as such. I really like African music, so I'm here, with pen in my hands, reading every single entry in your blog! thank you. Great job!